James Polk McCoy, husband of Georgia Ann Leonard. Georgia Ann Leonard, wife of James Polk McCoy. Georgia is most likely buried in an unmarked grave near James McCoy. Mr. James P. McCoy died at his home just over the line in Bartow County last Tuesday morning of pneumonia. Mr. McCoy was raised in Cherokee County near Sharptop and was 76 years old when he died. He married Miss Georgia Leonard, who with four children survivoe him. His remains were laid to rest at Macedonia cemetery on Wednesday. Mrs. J.P. McCoy of Bells district died Saturday at her home after a prolonged illness. 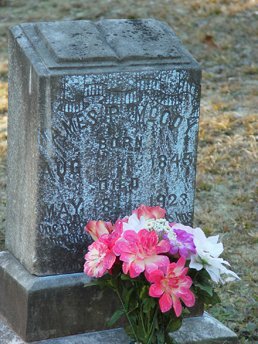 She was 87 years of age at the time of her death, having spent a great portion of this time in the community where she died. Her remains were laid to rest Sunday at Macedonia cemetery in Bartow County.